For the past ten days, two stories have dominated the news cycle. First are stories that claim the IMF and the Europeans are discussing with Greek officials the possibility of debt restructuring; and second are stories that state claim no such discussions are taking place. Obviously, all sides should be (and likely are) considering the pros and cons of restructuring. This is no surprise. But what does all this talk mean and why does it matter? Let me begin first with four observations. First, markets already assume that Greece will default. 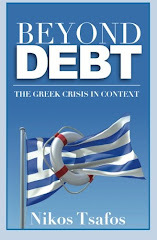 A series of Bloomberg polls conducted in 2010 and 2011 show that around three-fourths of respondents assume a Greek default, while several renowned economists regularly repeat their view that Greece will be forced to default sooner or later. Yields on long-term bonds continue to remain high, while Bloomberg reports that credit default swaps suggest a two-thirds probability that Greece will default within five years. Second, default is already on the minds of the Europeans. In March 2011, the European Council endorsed a preliminary agreement whereby a “haircut” is likely scenario for any country seeking EU help after 2013. As Sebastian Mallaby put it: “In a masterpiece of double-talk, Europe’s leaders are reassuring bond holders they will get all their money back – except that from 2013 onward, they might not.” So the idea that restructuring is jut surfacing on the agenda is silly. Third, the Greek government is increasingly unpopular. The intention to vote for the ruling party has reached its lowest post since national elections in October 2009. The prime minister’s popularity also took a deep dive in March 2011, reaching all time lows as well. Given that the government’s mandate is premised on the idea that the “Memorandum” is the only way forward for the country, talk of default makes its political position effectively untenable. Fourth, Greece has no reason to default yet. The country will still run a primary deficit in 2011, so a suspension of interest payments does little good right now. Moreover, Greece’s financing needs for 2011 are met fully by a combination of short-term debt issuance and the money borrowed from the troika. Greece will need to return to markets in 2012 to borrow an estimated €40 billion – until then, high borrowing costs are a theoretical but not real problem. All these observations paint the following picture: restructuring is on everyone’s minds, but the Greek government is steadily losing its popularity and to give credence to talk of restructuring could halt its reform agenda and possibly trigger its downfall. Thankfully for the government, it does not need to ponder default yet. The government’s dilemma is this: how to reconcile the fact that it may have to default with the reality that its best hope to avoid default is to implement a program whose basis of popular support is its claim to help the country avoid default? Exactly. The government faces the following outcomes. First, and least likely, is that market conditions improve so dramatically that investors ease the pressure on the European periphery. In this case, the risk premium on Greece falls not because Greece is reforming but because markets are more risk taking. This scenario would assume a complete reversal of both market sentiment as well as European policy, which has so far fed market anxiety by indecision and by suggesting that future haircuts are possible. Second (and ideally for the government), the government hopes that when it returns to markets in 2012, its reforms will have started to deliver results, thereby gaining some market trust. In this scenario, the government’s ambitious privatization program can play a dual role: not only does it convey a commitment to change, but it also helps raise money that the government then does not need to borrow from the market. In other words, by selling off assets, the government can reduce its borrowing needs and raise money at a more reasonable cost. Third, the government may indeed have to default. On one extreme (but a likely scenario), the announcement of default itself would trigger the government’s collapse. On the other extreme, the government would survive a default. For this to happen, the economy should be already on a growth pattern, which realistically means mid to late-2012. Default would have to be painted as the inevitable outcome that will help expedite the transition, coming at a time to ease pressure on households and companies and accelerate economic growth. Timing will be key. There is therefore little reason for the government to spend time thinking about default now. It is effective political suicide and it distracts resources from making the changes that the country really needs. Even if default comes (which it might), the government’s only hope to survive is to announce it from a position of strength given some economic improvement. This is what makes 2011 so crucial – it is the government’s last buffer year. Defaulting now means the government has given up. Interesting analysis on the Greek perspective, but I forward the premise that default will not be decided by Greece nor the EU but by IMF. The key criteria is debt sustainability and the external balances. Even under the most optimistic scenarios, there is no sustainability in Greece's finances. And if there is no sustainability, IMF would not lend. Debt restructuring will be the prerequisite for new funds.